Robbie Brady produced an impressive Republic of Ireland debut as Giovanni Trapattoni's understrength side accounted for Oman at Craven Cottage. Manchester United's Brady set up Shane Long's seventh-minute opener and he volleyed a second 15 minutes later. Another Brady free-kick was glanced home by Kevin Doyle on 36 minutes. James McClean, after his Twitter row, came on before Eid Al Farsi replied on 72 minutes but another debutant, Alex Pearce, added the Republic's fourth. Manager Giovanni Trapattoni told McClean he was lucky to still have an Ireland career after Friday night's outburst but, amid the loudest cheers of a low-key night, the Republic manager introduced the Derryman for the final 30 minutes. In his angry Twitter posting, McClean had described his lack of action in the World Cup qualifier with Kazakhstan as a "joke" and also swore after being left on the bench in Astana, before later apologising. The Sunderland winger tested Oman's Wigan goalkeeper Ali Al-Habsi from a free-kick after his introduction and also went close with a fierce volley. However, it was Brady's left foot that was the main feature of the contest. Brady's deep free-kick was nodded back by Sean St Ledger in the seventh minute and Long headed into the empty net. After Ahmed Al Muhaiyri had gone close for the world's 53rd-ranked team, the Irish doubled their lead as 20-year-old Brady volleyed in from the edge of the box after Oman had failed to clear a Seamus Coleman cross. Oman's Abdullaziz Al Muqabli had a penalty claim turned down in the 31st minute after a St Ledger challenge and the game was over as a contest five minutes later as Doyle glanced home a whipped-in free-kick from Brady that David Beckham would have been proud of. Trapattoni brought on Reading defender Alex Pearce and Motherwell goalkeeper Darren Randolph at the break for Marc Wilson and David Forde. Randolph went on to pull off a terrific diving save to deny Al Farsi but the same player did pull a goal back on 72 minutes after poor marking from the Republic defence. However, Pearce headed home the Republic's fourth goal five minutes from time after a cross from another substitute, Aiden McGeady. Rep of Ireland: Forde (Randolph 46), Kelly,St. 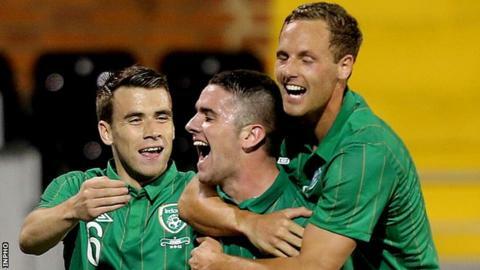 Ledger, Meyler, Wilson (Pearce 46), Coleman, Keogh, McCarthy (Cox 65), Brady (McGeady 70), Doyle (McClean 61), Long (O'Brien 73). Subs Not Used: Ward, Henderson. Oman: Al Habsi, Al Musalami, Muhaiyri (Al Jabri 77), Ghailani, Saad Al Mukhaini, Al Balushi (Abdul Salam Al Mukhaini 78), Ibrahim (Al Hadhri 69), Al Farsi, Al Mashri, Maqbali (Basheer 69), Al Hosni. Subs Not Used: Al Rusheid, Al Awaisi, Habi, Al Ajmi, Al Saadi, Al Rujaibi, Nazmuddin.